Looking towards a man wearing the metal arm badge of the Chief's Police (right shoulder, less visible than in another image), with a rectilinear building in the background and a tall post with a sign above it. 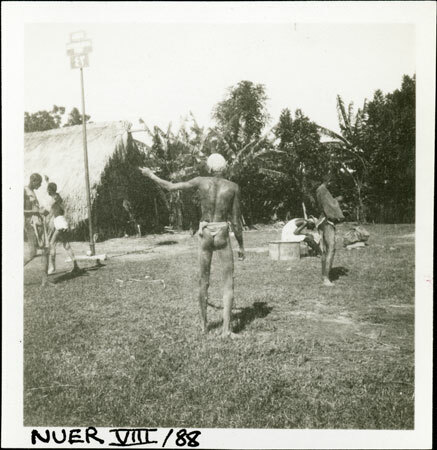 The native police force was recruited from 1927 to assist with the enforcement of judgements made at local chief's courts, which were also augmented at this time, a policy forcefully pushed through by C. A. Willis who became governor of Upper Nile Province in 1926. Evans-Pritchard arrived at Adok on 1st October 1936 after making a survey of the Luo of Kenya. He then moved on to spend most of his time among the Leek. Note on print reverse ms pencil - "71 Adok" & print front border ms ink - "NUER VIII/88"
Morton, Chris. "Nuer men" Southern Sudan Project (in development). 03 Jan. 2006. Pitt Rivers Museum. <http://southernsudan.prm.ox.ac.uk/details/1998.355.391.2/>.